Goodness gracious, great ticket sales! 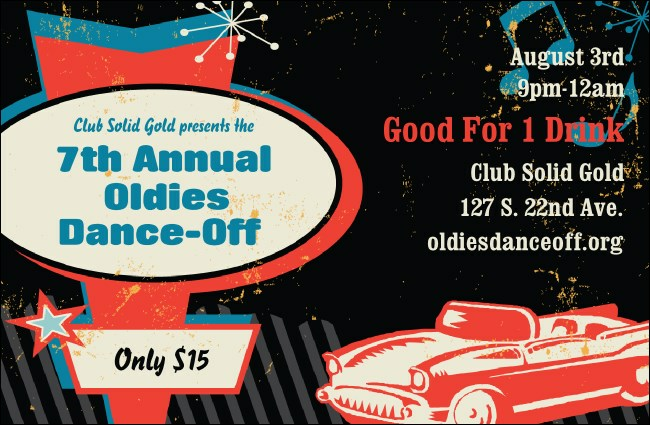 Keep the bar at your next sock hop hoppin’ with the colorful Oldies Drink Ticket! Sell drinks early and you and your guests can rock and roll while the liquid refreshment flows! Each ticket template is individually numbered for security and has room for a custom image upload! Fe, fi, fo, fum I smell great designs! A matching event kit is available through TicketPrinting.com!